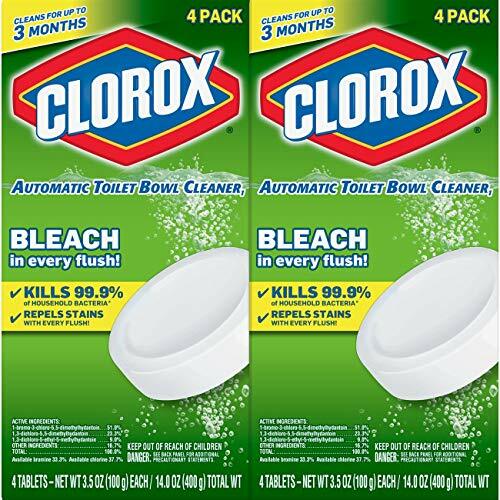 Clorox Automatic Toilet Bowl Cleaner tablet cleans and deodorizes with the power of bleach and kills 99.9% of household bacteria in the toilet bowl water. Each tablet sanitizes the toilet bowl water in 5 minutes, cleans for up to 3 months and helps prevent tough hard water, mineral and lime scale stains. These easy to use tablets keep your toilet smelling fresh and sparkling clean with every flush, leaving bowl water crystal clear. To sanitize, clean and deodorize, simply drop a tablet in the toilet tank and let it do its work. The tablet does not harm the septic tank. With Clorox, you know your toilet bowl is clean and disinfected.